Like Apple Siri, Google Assistant, Samsung Bixby and Cortana, Amazon Alexa is yet another digital assistant for a wide range of devices which include Windows 10 PC, Windows Smartphone and other Windows devices. Amazon calls it Alexa for PC. This guide will show you how to download Amazon Alexa app for Windows 10 PC and how to use it. Amazon Alexa was originally made for Amazon’s Echo family (Echo Dot, Echo Plus, etc) devices. It was then also available for Android and iOS. Now Microsoft has partnered with Amazon to bring Amazon Alexa to Windows 10 devices. It will work with Cortana to provide a better experience. Here’s how to download Amazon Alexa app for Windows 10 PC. You can download Amazon Alexa app for Windows 10 PC from here (link removed, please read the updates below). The setup is an .exe file which will install Amazon Alexa app upon running. You may need to change your system language to USA for it to work. Update: The Amazon Alexa for Windows 10 PC download link no longer available. Every Alexa for PC download link we know of has been removed as if they never exist. As far as we know, it is most likely because Amazon Alexa didn’t work correctly in some Windows 10 PC. Some says that it requires unique firmware (or hardware) to make it work even on a basic level. 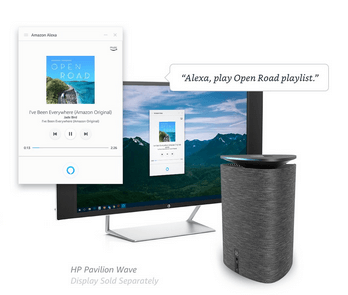 Based on how Amazon newly introduces Alexa for PC, Amazon stated clearly that now Alexa for PC will only works with selected desktop and notebook models. Amazon Alexa will either be preinstalled or offered as part of the device initial apps setup. So, for now, there is no way to install Amazon Alexa for Windows 10 PC unless if it was already preinstalled when you purchase your desktop or laptop PC. 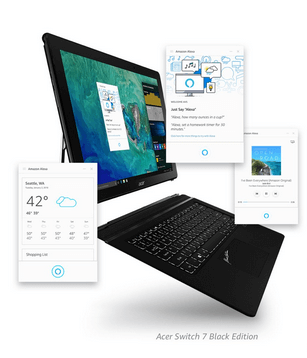 Amazon Alexa app is now available on some of the new Windows 10 laptop and desktop PC models such as those from Acer, Asus, HP and Lenovo. Why doesn’t Amazon Alexa download for Windows 10 PC available for all users? Well, our guess is that Amazon doesn’t want you to have it. They want to make Amazon Alexa app for PC as an appealing feature so that you will purchase the laptop models they partnered with just to have the feature. If you happen to have one of the laptop or desktop PC that supports Amazon Alexa app, here’s how to open it. Check if you have an Amazon icon on your start menu taskbar. If it’s on your taskbar, it means that your PC has Amazon Alexa preinstalled. Click on the Amazon icon to launch the Alexa for PC app. Optionally, you can search Amazon Alexa directly from start menu. Upon launching Amazon Alexa for PC, you will need to login to your Amazon account in order to use it. If your PC supports Amazon Alexa, you can say the work “Alexa” using your microphone to wake Amazon Alexa. You can then ask a question or give a command. If you’re not sure if your device supports Amazon Alexa, try to find it in your device’s software management tools. Since Amazon Alexa app for Windows 10 PC download no longer works, you should be aware of fake downloads around which may bring malware to your PC. Description for sharing: How to download Amazon Alexa app for Windows 10 PC, how to enable Alexa for PC, and how to use and wake Amazon Alexa in Windows 10.